Selecting the proper central vacuum attachment set is just as important as choosing your central vacuum power unit. Your home will be cleanest when matching your hose and cleaning tools with your power unit and flooring. The amount of carpet versus hard flooring, along with the overall suction power of the power unit will determine the best tool choices for your cleaning needs. We look forward to assisting you in determining the best attachment kit options for your home or business. Are our tool sets compatible with your existing vacuum system? YES! 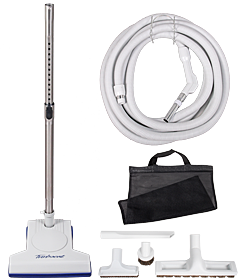 99% of central vacuums, no matter the brand, are "plug-and-play" with any of the kits below. If you have any questions at all, please give us a call at North County Vacuum. The Stealth Kit is at the top of its class for durability, control, and power. 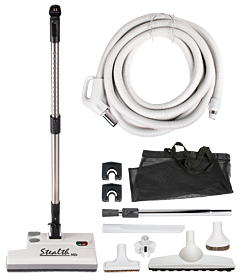 For consumers wanting the industry's best, the Stealth is the right choice for all of your cleaning needs. 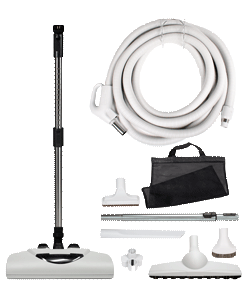 Kit includes extra wands and top-quality horse-hair attachments, the Axis double-swivel floor tool, and the dual-voltage hose with 3-way switch on the handle. The new Response Kit offers a true, innovative solution for today's high-density soft carpets such as Bliss Beaulieu SoftSense, Mohawk SmartStrand Silk, Shaw Caress, Platinum Plus Softspring, TruSoft Stainmaster, and Dream Weaver PureSoft Cashmere. Its CT-23 Response II works freely over all carpet types, allowing air to enter through vents which allows the brush to easily glide over soft carpets. 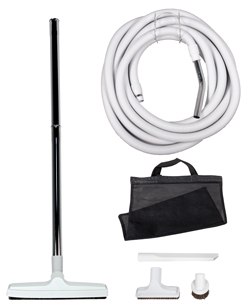 Deluxe Kit includes the CT-23 Response II Power Head, telescopic wand, 12" wheeled floor tool, universal electric hose, and other quality attachments. 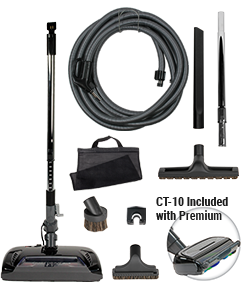 The Premium Kit also includes the electrified CT-10 Response Brush for hard floors and throw rugs. 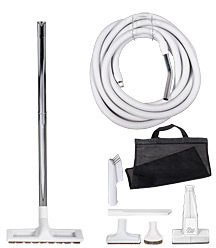 Kit includes two plastic wands, the crevice tool, upholstery and dusting brushes, 12" floor brush, and storage tools. Comes with black accessories. The BlackHawk Kit delivers all the benefits of an electric brush. Clean carpet deeper and more powerfully than with an air-driven brush. 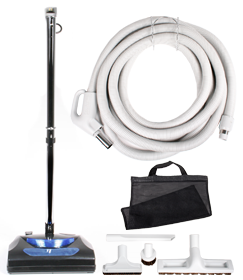 Keep your home as clean as it can be with all the features of the BlackHawk Kit. The TurboCat is the industry's best air-turbine cleaning head. It has the cleaning power of rotating bristles without the inconvenience or cost of an electrical cord. The light-weight hose employs an on/off switch on the handle. The Standard Kit includes the TT27 Head. This widely popular air-turbine vacuum is lightweight, value driven, and perfect for throw rugs and small carpeted areas. This kit is also available with a convenient on/off switch on the end of the handle. 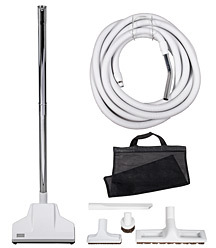 The Basic Kit provides the necessities for cleaning your home. The kit includes the Basic Hose and other helpful accessories. 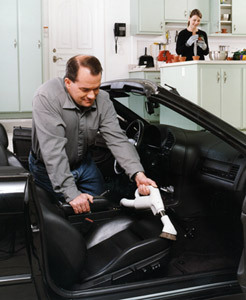 Use your central vacuum to clean your garage, vehicles, porch, eaves, walkway, boat, and more! The hose plugs directly into any wall inlet or vacuum unit utility valve. Tools for Concrete Floors, Cars, etc. 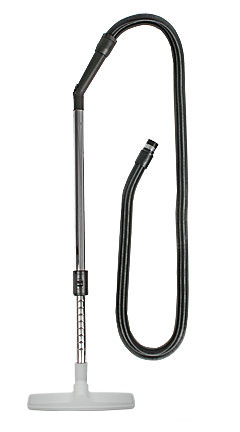 Easily clean up kitchen spills, dirty mud rooms, or touch-up bathrooms using the Stretch Hose. The Stretch Hose even fits into a drawer, so it can be easily stored near high traffic areas.